Sjoerd de Jong to the Hoogland family. Well Mr. And Mrs. HooglandI like to congratulate you with the 25th anniversary of your marriage and that you may get a lot more [years]. Well farmer, that will be a great party with you, I can imagine that. Now it is about 8 weeks that we left Holland which is hard to believe for me. But the worst part is that one leaves father and mother and brothers and sisters. Once one has gone on the journey it is all right. But to be on that ship I didn't like that much especially not the beef and potatoes Johannes. Well farmer, one see a lot when one goes to the far West, I can tell you that. So I'll write some smaller Ytje, otherwise it [the paper] is filled too fast. Now I am here with the farmer where Johannes is a laborer with. I like it to be here. Today I worked with a spade ( such a pick-axe I've seen before in Holland) to dig a hole into the ground. But it was rather frozen. I just had done 3 feet then I had to stop because the ice was on it. Well farmer, I am also milking with this farmer, he has 7 milk cows and 11 heifers [young cows between ½ and 1½ years old], 2 calves and 18 pigs and also 16 piglets. Everything is different here Johannes than it is in Holland. If one is spreading manure here than you don't have to put it off [the cart], you just need to pull at a spring and the cart empties itself [manure spreader]. This farmer has nice horses J[ohannes], they all are as heavy as a Belgian horse and a “........” [other kind of horse I guess]. He has 16 horses none of them older than 7 years. If he is lucky than he can get 6 colts this year. Now I stop writing because I become sleepy. Greetings from your friend Sjoerd de Jong. Please also greet [your] father and mother and sister. Later on I'll write again famer. 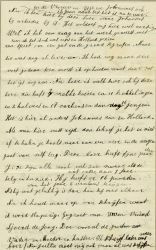 You [Mr. Hoogland] also have to write me. 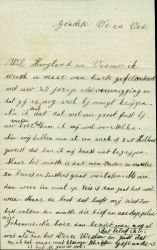 [At the top of this paper is written] and also your wife and Ytje and Johannes too. I'll go to bed it is 10 o'clock [p.m.].